The exhibition, illustrating the archaeology and architecture of Vijaynagara in South India through a number of amateur and commercial photographers, offered an opportunity to analyze one of India’s most extensive medieval sites. The display focused particularly on the stylistic and visual similarities and differences the various photographers to the site established, the technologies available over time, and their influences on the compositions adopted by each practitioner. 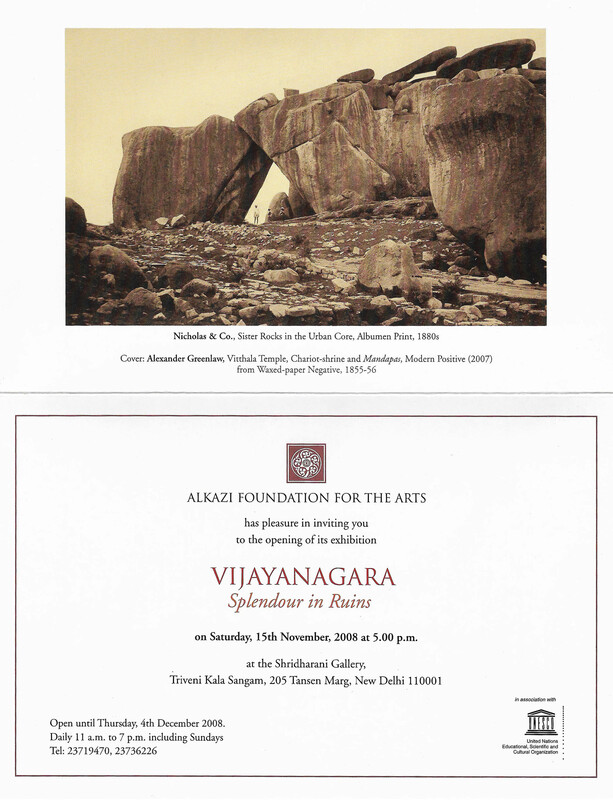 Starting with Alexander Greenlaw in 1855-56, through the work of Nicholas & Co. in the 1880s, Vijaynagara is systematically mapped in its various states. The exceptionally accomplished Greenlaw, probably the first to reach the site, captured the temples, shrines, palaces, and pleasure pavilions along with the dramatic landscape that surrounds these ruins with his camera. An architectural photographer with lesser influence over external factors, Greenlaw encountered significant constraints concerning the geography of the building, its access, the weather and time of year, as well as specific technical limitations which forced his composition into conventional nineteenth-century aesthetics. Juxtaposing these images with the later photographs of Edmund David Lyon delineates the influence of changing technologies on compositions, with Lyon using wider lenses and producing a complete coverage of the temples in contrast with Greenlaw who was forced to crop some elements. The exhibition also presented some colour photographs by Madhu Gopal Rao (2007) from the same perspective highlighting further a sense of technological changes and time. 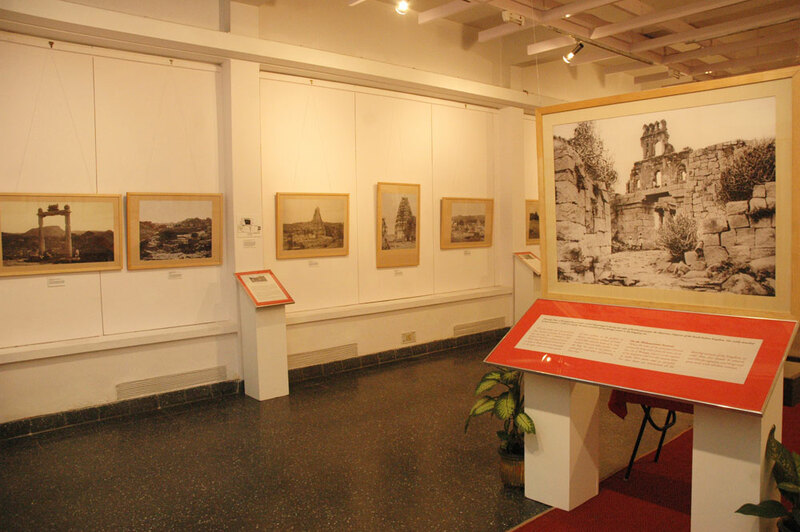 The photographs, portraying ruins of the Virupaksha temple complex, the Krishna temple, the Hazara Rama temple, the Queen’s Bath and the King’s Palace amongst numerous others, were displayed under various categories – Sacred Centre, Royal Centre, Urban Core, and Suburban Places. Presenting the works of Greenlaw, Lyon, William Pigou, Willoughby Wallace Hooper, Nicholas & Co. and others along with maps from the period, the exhibition, through a comprehensive overview of commercial, archaeological, and other documentary activities at Vijaynagara in the 19th century, examined the role of photography in resurrecting the idea of the site, aiming to rouse public consciousness about living ruins. A talk on “Working the Archive: Popular and Political Engagements” by Annapurna Garimella was also held on March 28th at the Lalit Kala Akademi.